Karas Pen Company: Small Batch Pen Sale. ReBolts and Blackouts. 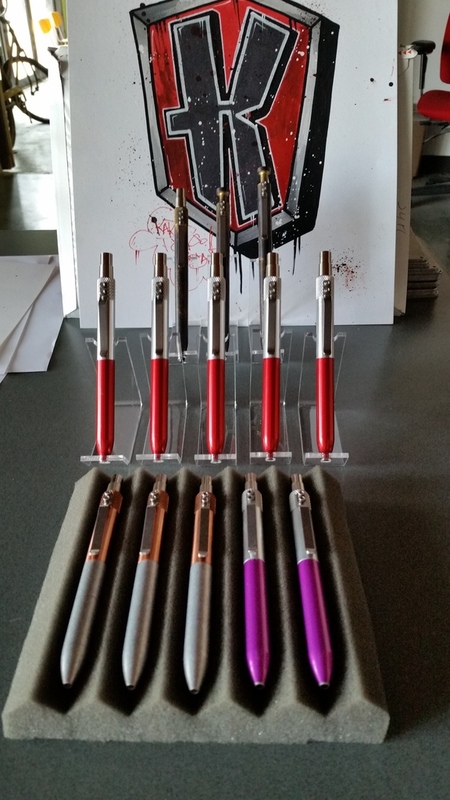 Now that the frenzy has passed on the Fountain K Press Release, I figured we could come back to the Karas Kustoms/Karas Pen Co Small Batch Sale. I have added a few more pens that we were able to get Stonewashed this past week. Prices include shipping, refill and spring/spacer kits. Pens come fully assembled. The ReBolts have been pre-modded to work "out of the box". Enough of the disclaimer, on to the sale. The Blackout Series is our latest foray into creating unique Small Batch version of the Karas Kustoms pens you have come to know and trust. 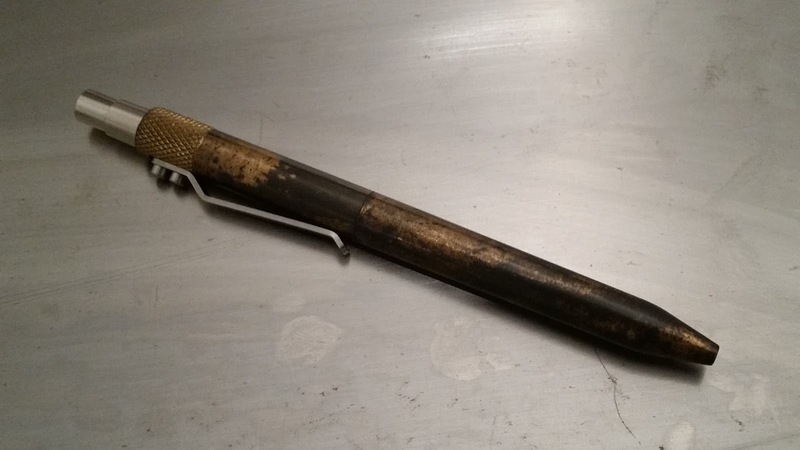 We rough polish, clean and then hand apply a layer of chemical to black the surface of the brass pens. Due to this being hand applied, no two pens have the same finish and as time and use play with the metal, the finish will change and take on a different appearance unique to your daily writing position. These pens are truly one of a kind. This is our Brass Bolt with Blackout finish, fully functioning with Parker style refill included. The Blackout Series is our latest foray into creating unique Small Batch version of the Karas Kustoms pens you have come to know and trust. We rough polish, clean and then hand apply a layer of chemical to black the surface of the brass pens. Due to this being hand applied, no two pens have the same finish and as time and use play with the metal, the finish will change and take on a different appearance unique to your daily writing position. These pens are truly one of a kind. This is our Brass Bolt G2 with Blackout finish, fully functioning with Pilot G2 style refill included. The Blackout Series is our latest foray into creating unique Small Batch version of the Karas Kustoms pens you have come to know and trust. We rough polish, clean and then hand apply a layer of chemical to black the surface of the brass pens. Due to this being hand applied, no two pens have the same finish and as time and use play with the metal, the finish will change and take on a different appearance unique to your daily writing position. These pens are truly one of a kind. This is our Brass Retrakt with Blackout finish, fully functioning with Pilot G2 style refill included. The Stonewashed Series is our initial entrance into Small Batch pen creation. We took existing anodized pens, used a mild abrasive on the anodize, then put them through a long rough tumbling process with specific media and liquid to for a "worn or distressed" look on the pen. The Stonewash finish looks as though the pen has had years of use and carry but remains fully functional. It also softens edges and creates a "softer" texture on the anodize overall. This has been applied to our ReBolt pen, which is a combination of our Retrakt upper barrel with a Bolt lower barrel and a custom modified spacer. This pen is the daily carry pen of Bill Karas, Karas Kustoms Owner and Dan Bishop Karas Kustoms Design Lead. 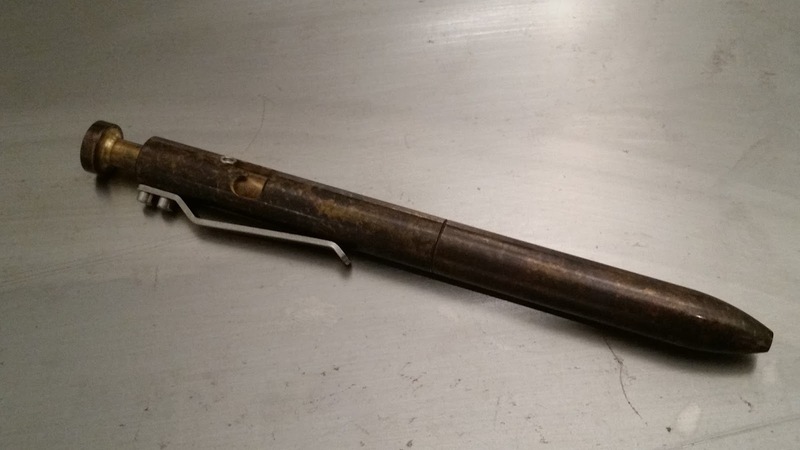 It comes fully functional with a Parker style refill. This is a custom special edition combination. It contains one of our Stonewashed Blue Cubes and a Stonewashed Silver Render K with Stonewashed Blue cap and tip. The above price includes shipping and the corresponding pen refill. These two items are perfect for your work desk or a students dorm room. The only combination like this. This is a custom special edition combination. It contains one of our Stonewashed Orange Cubes and a Stonewashed Orange upper barrel Bolt and Blackout Brass lower Bolt and knob. The above price includes shipping and the corresponding pen refill. These two items are perfect for your work desk or a students dorm room. Limited supply on these, get them while they last. Questions concerning Small Batch, One-Off or other non-standard Karas Kustoms items can be directed to info@karaskustoms.com, subject line "Small Batch". Pens are the important part of our lives, these are very beneficial for students education, there are many benefits of writing with pens through academic assignment writing, it fires op the brain of student in different ways, it sparks creativity, it limit distraction, many companies make pens in the world. I am really fond of god pens. Every pen attracts me and I make it my own. Here I find a lot of pens that are not in my collection. I will surely buy then as early as possible best essay writing service. I think this is an awesome collection.